Since I often experiment using almond and coconut flour in baked goods, it seems only fitting that I make cinnamon bun muffins using coconut flour, as an alternative to my earlier gluten-free cinnamon bun muffin recipe using almond flour. Both are great gluten-free flours, and impart different texture and flavor. And there are pros and cons to using each kind of flour, but in the end, it comes down to taste and your body. Big confession here: I prefer muffins made with almond flour, but I’ll let you be the judge. I generally prefer the texture of almond flour baked goods, but sometimes coconut flour knocks one out of the ballpark for me. And one differentiator for each side of the fence: almond flour costs more, but coconut flour uses more eggs. So if you love what coconut flour offers you, can’t or don’t eat almonds, or enjoy baking with coconut flour, this recipe is for you. One thing I will note that I do a bit differently here than in the recipe using almond flour – I don’t put the topping in the center of the muffin. I found it wasn’t necessary to do because the topping spread well through the batter when placing it on top. But, it’s up to you. Also, you could lower the amount of sweetener a bit – maybe to 1/3 of a cup and it will still taste good, but not as sweet. I’m a huge fan of using maple syrup in baked goods, but if you don’t or can’t have maple syrup, use honey. I haven’t tried other sweeteners, but if you do, please share it with us. I love to hear what others do with my recipes! Cooking and baking is a creative process, so don’t hesitate to play with the recipe, or modify it to your taste or needs. Update 12/13/13: I’ve reduced the amount of honey or maple syrup from 1/2 cup to 1/3 cup with great success. If you’re experiencing an “eggy” texture, I suggest using 1/3 cup of sweetener. I also updated the technique for dispersing the topping throughout the muffin. To make this dairy-free, use dairy-free yogurt or milk, and for SCD use honey. Combine all the ingredients in a bowl and whisk until well-blended. Prepare a baking pan with muffin liners. Add the eggs, milk, and honey to the dry mixture and blend well by hand, or use a mixer or food processor. Let the batter sit for a few minutes to allow the coconut flour to absorb the moisture. Spoon about a tablespoon of topping over each muffin and then top off each muffin with more batter, about 3/4 of the way filled. Drizzle the remaining topping over each muffin and use a toothpick, fork, or spoon to blend the topping into the batter. Bake for about 24 minutes, or until a toothpick inserted in the center of a cupcake comes out clean. Cool and enjoy! Store for a few days at room temperature (covered), seal and store in the refrigerator for a few weeks, or seal and freeze for a few months. Would egg replacer work in this recipe? It looks wonderful! Gayle, Have you tried with the egg replacer? Its so hard to find egg free gluten free baked good recipes. So Wen you can replace eggs with applesauce in recipes? What is the ratio? 1 egg = how much applesauce. I know applesauce keeps things moist but does it bind, that is the question. Think I will make these on Saturday morning for breakfast. only 1/2 cup of coconut flour? I know it absorbs a lot of liquid and there are 4 eggs vs 2 in the almond flour…Still seems a bit light on “dry” ? Most coconut flour based recipes use VERY little coconut flour and LOTS of liquid. Trust me, it’s best. Coconut flour absorbs tons of liquid and you don’t need much at all. I made these for breakfast this morning and they turned out great, though the cinnamon and butter mixture just kind of dissapeared into the batter, but still tasted wonderful. Not sure about the life of coconut flour, sorry. I just recently tossed a bag that smelled bad. Maybe storing it in the fridge would allow it to last longer. I keep my coconut flour in the fridge and I’ve never had to throw any away. I have these muffins in the oven right now and they smell so good! LOVE your recipes! I always keep my coconut flour in the fridge, and have never thrown any away-same with my daughter in law. I make my own coconut flour…the pulp that remains after making coconut milk! I spread it thin on a silpat covered baking pan and dry it out in a warm (lowest setting) until crumbly. I run it through a coffee grinder in small amounts and throw it in the freezer. I can’t get it as fine as white flour, but it seems to work well :). Deedee…I’m still learning on carb counts…it looks like the majority of the carbs comes from the syrup and/or honey, yes? I’ll have to replace that, but these sound wonderful! I made the almond flour ones the night you posted them and they were fabulous! I can’t wait to try this version. Thank you for such great recipes! OMG! These look fantastic. I can’t wait to try them. I love baking w/coconut flour. I do some baking w/almond flour too. Thanks for the great pictures and recipes. I followed your recipe to the T and it took 5 more minutes to test done w/a toothpick and they were still very wet/soft on the bottom. I plan to make the recipe again using a different brand. I’m still curious about which one you used. These were wonderful! I didn’t have any yogurt so I subbed in coconut milk and they came out super moist and delicious. I also made this 7 minute frosting: http://www.comfytummy.com/2011/04/04/a-better-7-minute-frosting-scd-friendly/ (it’s really just meringue) to put on top and it tasted great with the muffins! I tried these, but I used clabbered milk instead. They were fantastic! I have some Coconut Flour in the fridge. Will be trying this very soon! not sure – but someone used coconut milk with success, if that helps. You say that coconut butter will replace butter in the recipe above. Did you mean coconut oil? Coconut butter has a texture like almond butter. Have you used it in this recipe? ooh – thanks, I meant coconut oil. I haven’t used coconut butter yet, but I am curious. Coconut Butter and Coconut Oil are the same thing. The oil is solid at room temperature like butter and when you heat it to 76 it liquefies into oil. I often use the solid coconut oil to spread on my scones instead of butter. Works great. Judie, coconut butter is different than coconut oil. The butter is a solid at a higher temperature than the oil. Coconut butter is the meat of the coconut processed (ground up) until it is a buttery consistency. Like Almond butter, or peanut butter. Coconut oil is JUST THE OIL. Not the “meat”. Oh, good! I have to use Stevia as well instead of honey. I was wondering how much to use. Thanks! Erica, these are great! Thanks for sharing. I couldn’t find my muffin tins, so I used four mini loaf pans (3×6″) and it worked great. Cheers! My son can not have dairy. I used coconut milk instead of yogurt and it was delicious. I also used spectrum vegetable shortening in place of butter. Any suggestion for cutting out some eggs or at least the yolks? we are watching cholestrol and weight here in GF home. I am on a grain free diet, and I’m always on the look out for great tasting food (I get bored easily). This recipe is wonderful, and my little ones loved it! I didn’t have yogurt, so I used coconut milk instead. I also used maple syrup instead of honey. Wonderful! Tasty! I used 1/3 cup honey in the muffin batter and 2 tablespoons brown sugar in the topping. Thanks! Wow these were amazing! I needed some inspiration this morning and made these- but I mixed coconut flour and blanched almond flour and made them dairy free with coconut oil and milk. and linked back to your post. I loved the little bit of walnuts, they added a great texture! I am baking these as we speak but I was unable to bake 12 muffins and only 9. I replaced the yogurt with coconut milk and mixed the batter but it wasn’t smooth like cake batter. Was I supposed to make the batter smooth or chunky like most muffin batters? Thank you!! I loved the flavor of these muffins! They didn’t expand and grow to look like ur photos but I will try again and make sure the batter is smooth. I had to substitute the eggs with bananas since I can’t have dairy and ran out of egg replacer…also used coconut milk instead of yogurt… I am new to using coconut flour and these kinds of ingredients to bake. 🙂 but it is a great recipe! I love these muffins! I’m on the GAPS diet, so I substituted yogurt for butter and added pecans on top. They are so good! Great change-up of ingredients. Love pecans! I just made a gf squash muffin (from the naturally knocked up lady) for the first time combining typical gluten free flours (rice and tapioca) WITH coconut flour AND almond flour. It was AWESOME. It made them taste more normal then other recipes that I’ve tried. The rule that I learned is you add an extra egg per ounce of coconut flour and you never sub more than 1/3 of the flour with coconut. I don’t know any rules for almond flour. I haven’t, but this sounds great, and I agree that the ratios are the trick to getting the right texture. Good work and thanks for sharing this! Made this in a square pan, yielded 16 pieces. Yummy! Like coffee cake! Great sub! thanks for sharing this. Sorry it didn’t work out. Not sure what happened. I find them to be lighter than the almond flour version. Not everyone likes the coconut flour in baked goods. These muffins are AMAZING! by far the best recipe I’ve tried, and I’ve tried tons of coconut flour muffin experiments. you are the best!! I’m not a fan of Yogurt, can I substitute with sour cream? I’ve done this in almond flour muffins with no problems. Yes, sour cream is a great sub for yogurt. Thank you so much for an awesome recipe!! These were fantastic:) The kids and I really enjoyed them. These were quite yummy! Thank you! However, since I went sugar free last fall, and rarely have anything sweet, I actually found the topping way too sweet for my taste now. Next time I will significantly reduce the amount of honey, or perhaps use maple syrup instead as it’s not quite as sweet. Just made these today for my very picky GD and she did a thumbs up! Used honey in the coconut flour batter and maple syrup for topping…did cut cinnamon by half since she is a little “quirky abt cinnamon”. For myself, two tbumbs up! These turned out great, like sponge cake. To avoid dairy, I substituted soy yogurt and earth balance vegan butter. Can’t wait to try with almond flour! Thanks for sharing your subs (and I love your watercolors). Wow! This is the first recipe I have tried using coconut flour and these are DELICIOUS! So easy to make too! I am so excited that I found this site! Also, I tried your butter biscuits and they are amazing! I think you can. Someone in the comments (I believe) substituted butter for the yogurt. http://www.culturesforhealth.com/make-coconut-milk-yogurt-recipe Perhaps you could make coconut milk yogurt? Can someone help me??? Because im on a candida diet i substituted eggs for “flax eggs, honey for stevia…” and yoghurt for coconut milk,,,when i blended the batter was very thick so i had to add more coconut milk..the batter was still thick but not than much….they were in the oven for almost half an hour and the center ttasted kind of uncooked ,,,,i had to take them out because the top was getting very brown….what could have been wrong?? Thanks!!! GREAT site!!! I can’t wait to try these muffins as I was just saying the other day, “I must find a cinnamon bun something!” I can’t use any sweeteners but stevia and xylitol so I replace honey or maple syrup with the same or less measurement of xylitol and add a bit of hot water to it. Turns out great! Thanks. That’s so good to know. There are readers who ask about stevia and other sugar-free sweeteners that I haven’t tried. I love this recipe, I am always looking for new recipes to try with my coconut flour this is perfect! I made these for my kids and husband this morning. They LOVED them! Great recipe. These were awesome! Mine came out light and fluffy. Thanks for the recipe. I baked these yesterday and they are absolutely amazing! Thank you so much! Your recipes are the best. I like these better than the ones with almond flour. I used butter instead of yogurt, and for the topping I used melted coconut oil. I also used a blender. Yum, good to know thanks! I used 2 eggs and substituted ‘ground flax’ for 2 eggs (1 tablespoon ground flax to 3 tbsp warm water per egg). They turned out moist and light! Great to know. I’m going to give flax a try as well soon. Made these this morning for the family – I have to say they are pretty tasty BUT really sweet and all the cinnamon stuff sink the the bottom of the muffins. Next time, I’ll cut the honey in 1/2 in the muffin and also cut the amount in the cinnamon stuff. I also wont swirl it in. Yes, these might be a bit sweet for some. Also, if you’re batter is warm you probably won’t need to swirl the cinnamon mixture as much. I used WheyLow sweetner, usually I sub 1/2 of their white sugar type and 1/2 the brown sugar equivalent. Superb. Whey sugar is very good, and the effective carb is pretty low, 1 per tsp I think. So over a batch of using a cup, it is 32 carbs over the whole batch. I love these cinnamon muffins. Yesterday I made these into almond muffins. Instead of adding the cinnamon topping, I added 1/2 teaspoon of almond extract to the muffin batter. They turned out to be pretty good! I am not a huge fan of coconut flour but I am trying to cut down on the amount of almond flour I eat. I saw this recipe and knew I had to try it. Thank you!! The muffins were delicious. And, I like that you gave the basic muffin recipe and that you encourage us to vary it. Nice! These are really good. The consistency of the muffin is great. Can´t wait to pull these out of the oven 😉 I made a few variations. I added raisins and chopped walnuts to the batter & a this slice of banana to the bottom of the muffin pan & one atop the muffins. I also added the cinnamon to the dry ingredients & left out the topping, hence the banana on top.. I will keep you updated & thank you for sharing. This is the first recipe I have made with coconut flour and it was delish! I did use a little brown sugar instead of honey in the cinnamon mixture, but otherwise made it as written. These are moist and sweet, thank you for posting such a great recipe, I look forward to trying more. I so appreciate doing a search for a recipe and finding what I need. Thanks so much for sharing! So I just made these and they were awesome! I added 2 whole bananas to the batter and I used a zero calorie maple syrup as the sweetener. Worked out perfectly! Well almost..I filled the cups a little too high and the topping overflowed and burned on the bottom of the oven smoking out my house 🙂 but most importantly they didn’t ruin the muffins! Yum. My modification made 24 mini muffins. I added walnuts to the muffin as well as on top, organic coconut palm sugar instead of honey or maple syrup, added a scoop of vanilla Whey protein, and ground chia seeds….AHHHHHHHHHHMAZING!!!! I want to make these, but I’m going to use regular wheat flour, since I grind my own. 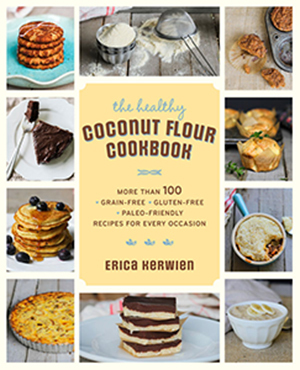 Would I use the same amount of wheat flour as you use of coconut flour? you can’t sub wheat flour for coconut flour. Coconut flour is very ‘thirsty’ and requires a lot of liquid, which is why there are so many eggs. The batter will be too thin using any other kind of ‘flour’. It would be best to use a different muffin recipe and then maybe use the topping from this one. I just found your website through a friend. I was wondering if you can do this with greek yogurt? Yes, it will be great with Greek yogurt! I love these, kids gobbled them down, I used rice malt syrup in place of the honey, as we watch fructose consumption, loved them! Today I will make them into a bundt cake…looking forward to a nice cake to take for morning teas that I can eat! Made these this morning using maple syrup (no honey) and coconut greek yogurt- yummy and moist! Just baked them with a few changes. I added 1/2 cup of almond flour for texture and removed one egg. I also added 1 tspn of vanilla extract (love this in most baked goods). They turned out moist and delicious. Can wait until my son tries it. I think it’s going to be his new favorite!!! thanks for sharing your changes. 1/2 cup of af plus the coconut flour? Interesting. Yes to the vanilla – it always makes things better. I just started SCD for Colitis and I have been trying to satisfy my huge sweet tooth – this did the trick! I couldn’t find my muffin pan so I used a loaf pan and had to cook it much longer, but it still tasted great. My 3 year old asked if there was pepper in it because it was too spicy 🙂 so maybe next time I will cut back on the cinnamon and add more honey. Thank you! Just ordered your cookbook too! Thank you so much! I just made your banana cake with coconut flour recipe. It is so moist and delicious. Now I want to make the cinnamon muffins. I’ve recently started eating kefir daily instead of yoguert. Can I substitute the yogurt with kefir? I’m glad I found your site, Cheers to you. Thanks. Yes, I think Kefir will work well! I just made these using Greek yogurt. The batter was really thick, almost like a dough, is that right? I baked them for 25-30 minutes and they came out quite dense and not at all sponge-like. Have you got any idea what might have gone wrong? Maybe the Greek yogurt? It’s a shame as the taste is lovely but the texture doesn’t seem right.. Sounds like the yogurt didn’t provide enough moisture for the batter. You can either use greek yogurt and add milk or water to the batter, or use a regular yogurt or milk. Thanks for your reply. I think I must have weighed something out incorrectly..
just made these… substituted more maple syrup for the honey in the toppings, substituted sour cream for the yogurt in the muffins. Absolutely the best muffin I have every had! Thank you, Thank you, Thank you! sour cream is a great sub! Thank you for the updated version! I am also using more coconut flour and this is a nice complimentary flour to the almond flour. Being on the SCD diet- at times consuming too many nut flours can be problematic for me- but the coconut flour is actually a fruit … not a nut- and we love that here in Hawaii. Mahalo! I never comment on recipes that I find but I felt the need to for this one and another. These are GREAT! I get so frustrated cooking with coconut flour and these were perfect. Thank you! I also (about every few days) cook your chocolate fluffy muffins…those are amazing too! I add sugar free chocolate chips to them. Thanks, Laura! what brand of choc. chips do you use, if you don’t mind. Happy New Year! I use Hershey’s sugar free chocolate chips or I also have added the Atkins chocolate candies I recently found. I don’t have a gluten allergy nor do I try to eat paleo. I just am trying to make better eating choices and I LOVE baking so coconut flour has been a savior for me; I can bake sweet things and still be eating good 🙂 I sometimes also add some protein powder to my icing. I am about to go bake these again! They were AMAZING! I dont know why but mine came out sort of ” jelly” inside. I followed recipe carefully. I would really appreciate any suggestions. not sure but are you in the US? ok, I asked because the egg sizes differ in the UK, Europe and elsewhere. You may need to go down one egg, because the jelly-like texture could be too much egg. Or add about 1/2 tablespoon more of coconut flour. I made a batch of these this morning. Followed the recipe exactly, except that I did not have honey, so I had to use Splenda. Nevertheless, these were delicious. Just a tiny bit dry, but it has been almost a month since I had anything even closely resembling a muffin, so I was overjoyed to put this in my mouth! The flavors were awesome. Thank you for the recipe. Next time, will try the honey. it was dry because you lost the liquid from the honey or maple syrup. you can try replacing the lost liquid with milk or water. Hi there, I was wondering if it’s at all possible to bake muffins with coconut flour without eggs? I use 1 tbsp chia seeds to 3 tbsp water. I tried it with a different recipe and it didn’t hold together. Any suggestions would be great! If really like to try this recipe too! I haven’t had great results replacing that many (4) eggs with chia or flaxseed. 1 or 2 eggs are usually ok, but not for this. Now if you want to pair down the recipe it might work, but I haven’t tried it. These were just delicious!!! I am mom to 3 sweet kiddos. Our family tradition for the past couple of years is to have Immaculate Baking Company cinnamon rolls for Saturday morning breakfast. We typically do not eat many sweets or grains during the week, so this was always a special treat for us. Last week we found out my oldest daughter has a gluten allergy. I wanted to find a wheat-free, gluten-free version of our cinnamon roll tradition. These muffins were my first attempt and they were perfect!!! I think they taste better than the cinnamon rolls!!! I am thankful that our first of many hurdles in the gluten-free life has been cleared smoothly! I can’t wait to try out more of your recipes! Thank you! I am allergic to coconut so what can I use in place of the coconut four? See the version of this recipe for almond flour (link in the beginning). I followed the recipe exactly but not sure why my muffins did not rise at all? this is my first time using coconut flour, but i followed the recipe exactly? any advice? yes, check the freshness of your baking soda; also, did you use yogurt? Made these with my 2 year old this afternoon. We only had organic banana vanilla yogurt on hand and we subbed 2 whole eggs for flax eggs. They turned out fantastic – delicate, fluffy and moist. I wasn’t sure how the banana flavor would work out but it added another dimension of flavor we all loved. We will definitely be making this again! Thank you. Thanks, good to hear it’s still a great recipe! Can I get a count on how many muffins this recipe makes? It’s helpful for those of us who move slow and have to prepare our cupcake liners/pans ahead. Thanks. I’m looking forward to trying this recipe! Haven’t tried these yet, will do so! Just had a “meta-reaction” as I read through comment after comment. (I’m old, I do that…) It’s SO AMAZING that we-all can try out and report on a (what’s looks to be fantastic) recipe — and share what works and doesn’t. How we’ve expanded or changed to suit or experimented to find what works for each of us and our families. These came out pretty amazing and I had no clue if they would turn out good or dud. But I was so happy when the came out tasting so sweet. Something I’ve really been missing since I started SCD. I used Yacon Syrup in place of the honey or maple syrup. They came out great!! You really nailed it with these! Every time I make something with only coconut flour I’m the only one who will eat them because of that texture! So, I only made one batch. I could have tripled it! We do have eight children, but they were that good! I used raw milk and pecans for the cinnamon mixture. Love that they are sugar-free! I just made these and they’re amazing!! Thanks for the recipe! Yes, you can reduce the syrup and still end up with tons of flavor thanks to the cinnamon! Wow!! These muffins are delicious and the cinnamon filling is to die for! Thank God I tried this recipe!!! My husband is diabetic and I can’t make him ANYTHING that he likes. Thought I’d give them a try using all natural non processed honey. They turned out fantastic and you would never know they’re made with coconut flour or with no white sugar. These are delicious!! I did cut back the honey like you suggested and they are perfection! Thank you for sharing this wonderful recipe!! These muffins are delicious! I made them last night and will be enjoying them again and again. I only just found your recipe, I soo much prefer using coconut flour to any nut flours. This recipe is amazing, love the texture. I have decided to us these as a base recipe for my coconut muffins and just keep adding different ingredients to the mix. So far everyone loves all of the ones that I have tried. I tried this recipe with egg replacer—I used 4 flax eggs (1T ground flax seed + 2.5 T water = 1 egg). It didn’t work very well for me, unfortunately…I would stick with real eggs next time. There was barely enough batter to fill 9 muffin tins, and they turned out a bit mushy, without a “bready” texture. Yes, I’m not surprised. I wouldn’t use flaxseed with a recipe requiring more than 1 or 2 eggs. You could try splitting the recipe in half. These were fun and yummy! I used maple syrup, pecans, and coconut oil. Next time, I am going to try butter. Thank you! Absolutely love this recipe! This is the best coconut flour muffin recipe for me. The texture seems just like a regular bread and there is no eggy taste! Every coconut flour muffin recipe I’ve tried tastes like egg so I am super excited for this!! I made these muffins and they are very good, although they have a wetty texture that I don’t like, they are very sticky on our fingers. Can you tell me what I did wrong? My husband has always been a cinnamon bun fan and he did not have any since 1985, the year he was diagnosed with celiac desease. I must admit he loved these muffins. Coconut flour is a bit tricky. It sounds like it might have too much honey or sweetener, since it’s sticky. This recipe is so full-proof though that I would check your measurements again and trying adding another tablespoon of coconut flour if you don’t want to reduce the sweetener. It sounds too wet. I have made these muffins a bunch of times. They are excellent, the only thing I would change is to double the recipe for 12 muffins. Otherwise you end up with 12 half muffins. The best coconut flour muffin i’ve EVER had. I am not usually a fan of coconut flour. These are absolutely scrumptious. I ate the entire batch in like 3 days. I made these last night the batter was very liquidy is that normal? Also the cinnamon topping setteled at the bottom for some reason. I used coconut oil but made sure I melted it before mixing and adding to batter. It is a bit thinner than most batters. That said, it sounds like it was too thin. Confirm that you used the correct measurements and then maybe reduce the amount of coconut oil or add a bit more coconut flour.